This is a new cue shaft with the new Carbon tecnology. Limited edition that ensure a great playing performance. Produced with the best material by Miki Co. Ltd. Under no circumstance should the ignite shaft be sandpaper or modified as it will damage the shaft outer finish and harm the quality of the ignite shaft. Additionally, this may create micro cracks that might release potentially harmfull ingredients dangerous to one's health. Any treatment with chemicals of ignite shaft, including cleaning and conditioning liquids, will deteriorate the performance and invalidate the Limited-lifetime warranty of the Ignite shaft. Do not ever use any smoothing or liquids on your ignite shaft. For maintenance of the surface o Ignite shaft, we recomend to use wipes or cloth with isopropyl alcohol. 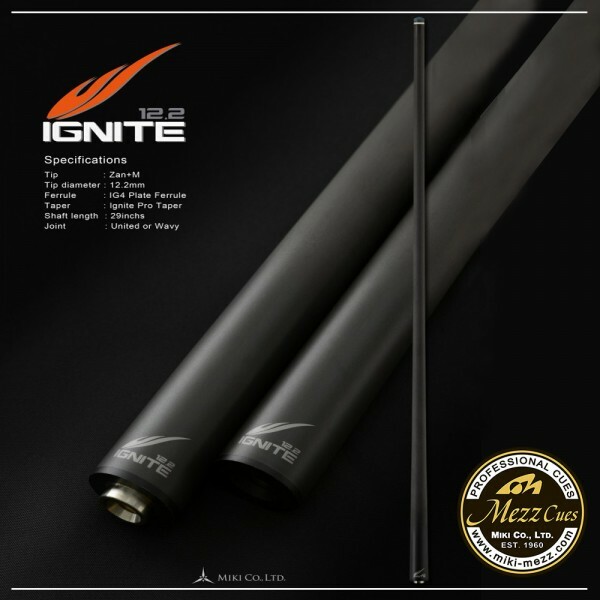 The Fornt end of the carbon fiber composite Ignite shaft is costructed with the ig plate ferrule and high-performance tip. It's prohibited to sand the shaft and all maintenance work, including tip replacement, must be completed by an authorized Miki repair center or profession repairman using a special set of tools. Any reduction in the above measurements will annul the shaft's limited-lifetime warnity and deteriorate it's performance. Expro shaft by Mezz cues. New shaft made by Mezz cues.